This was agreed upon after a meeting between held by the project management group in Gizo last week. The meeting was attended by representatives from SIFF led by the general secretary, Eddie Ngava, representatives of the contractor and the FIFA OFC development officer, Glenn Turner. The meeting resolved that the stadium work must be completed by December 7 so that the handover can be done on December 14. The meeting followed an inspection of the site conducted by the team which led to the conclusion that work on the stadium should be able to be completed by the end of November. Surfacing of the pitch is now complete and planting of seed will take place by the start of next week. Work on the stadium seating is also progressing well and the administration building is awaiting arrival of material from Honiara before final touch up work is done. The biggest reason for the delay of work at John F. Kennedy was a major variation which was not factored into the original planning but came later upon realisation of the problem of flooding due to the location of the pitch. The variation involved raising the playing surface by more than half a meter to ensure better drainage during heavy rains. While this added additional time for the project to be completed it is expected that this measure will help to protect the pitch from flooding in the long term. This delay was further compounded by frequent heavy rain pours experienced in Gizo over the past year and also issues with shipping of materials, especially sand, from Honiara. Staff from the SIFF turf and facilities department will be travelling to Gizo later this month to begin final clearing and levelling before proceeding with grassing of the turf. This grass will take up to a month to mature so the field should be ready for use by December if conditions are perfect. 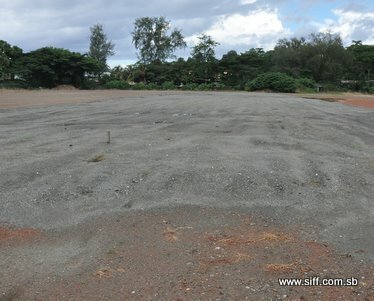 SIFF turf and facilities manager, Reuben Oimae, says that the condition of the pitch at this stage is suitable for the planting of the grass to go ahead. SIFF special projects manager, Phillip Ohoto’ona, whose office oversees the project says that he is confident that JFK stadium is worth the wait. “I believe that the handover ceremony is something the people of Western Province and especially of Gizo will look forward to. Once JFK is complete it will cater for the needs of the youth players of the province and it will certainly drive football development there,” Ohoto’ona says. The JFK stadium is funded by the FIFA Goal III Project and involved the resurfacing of the existing pitch to international requirements as well as addition of an office building and grandstand seating. The project was commissioned in September, 2009 and work began on June 2010. The Aligegeo stadium in Auki, Malaita Province, is another provincial stadium getting a FIFA Goal III project funded facelift. Once both stadiums are complete they will be able to host national league matches.